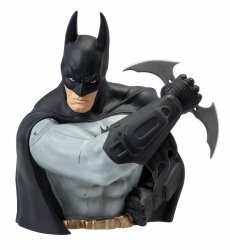 Interactive Entertainment, The Joker: Arkham Asylum Bust Bank. A PREVIEWS Exclusive based on the best-selling video game from Warner Bros. 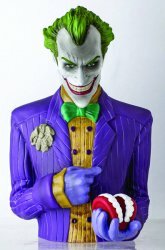 Detailed sculpt of the The Joker is based on the game's CGI files and makes it ideal for display on your desk or for storing your loose change! Collectors Note: Vinyl banks comes bagged not boxed from the manufacturer.